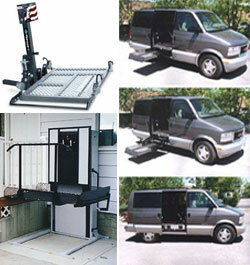 Wheelchair lifts and patient lifts for disabled people come in a variety of styles and designs. Each type of lift is designed for a specific purpose but many will offer a variety of uses. A wheelchair lift is generally lifts that will lift both the wheelchair user and the wheelchair together to allow access to different levels or a wheelchair or scooter into, or out of, a vehicle. Residential Elevators - can be used by wheelchair users, walker users, cane users or anyone who finds stairs difficult or unsafe. Incline Platform Lifts (IPLs) - are used for carrying people up and down stairways while seated in their wheelchairs. Porch Lifts - are used to lift people in their wheelchairs vertically between two different levels. They are most often used to access porches or decks but can also be used to access different levels of a building indoors (as long as they don't travel through a floor). Scooter Lifts - were originally designed to be used to lift mobility scooters into and out of vehicles without the user being on them but now several models are also used to lift and load empty wheelchairs. Van Lifts - are used for lifting users into and out of vans while seated in their wheelchairs or on their mobility scooters. Patient lifts are more transfer aids that help people get into, or out of, beds, baths, wheelchairs etc. or up and down stairways. Ceiling Lifts - are ceiling mounted lifts for transferring people between beds, wheelchairs, toilets, commodes etc. Emergency Lifts - are inflatable lifts used to elevate people up off the floor. Floor Lifts - are portable lifts for transferring people between beds, wheelchairs, toilets, commodes etc. Pool Lifts - are used to transfer people into and out of pools and hot tubs. Spa Lifts are used to transfer disabled people into and out of a spa or hot tub. Stair Lifts - are used for carrying people up and down stairways without their mobility device. 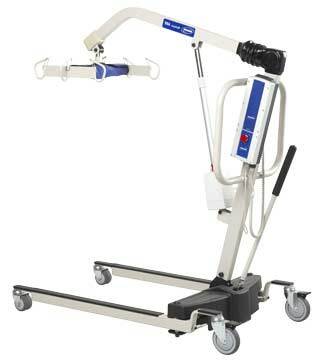 Standup Lifts - are patient lifts that are used for doing transfers by standing the user up. The information published is from my personal experience selling and servicing medical equipment over more than 20 years. The information is about the equipment and is intended to educate our visitors of the features that are available so they will be able to make a more informed decision when making purchases of patient lifts. We have also provided specific information many makes and models of lifts.This information has been gathered directly from the manufacturers' publications and dealers. While we believe all the equipment shown on our site is of the highest quality we do not endorse any of these products or the retailers who sell them. Because of the great variations in the conditions of the patients and the abilities of the caregivers, a lift that works perfectly for one person may be inappropriate for another in spite of a common or similar disability. The information on our site will provide you with information to help you compare products but it's advisable to have the dealer you are purchasing this equipment from help guide you with more specific Information. It may be necessary to actually try a patient lift before knowing if it will be suitable or not. We do not sell any products or services. This web site is an informational web site only. Many of product pages will have links to advertisers who sell the featured product. While we do have affiliate agreements with some of our advertisers, we do not recommend one supplier or dealer over another. You will find these online dealers advertise their pricing which you may find helpful when comparing products. For those who prefer to purchase products from local dealers check your Yellow Pages under "wheelchairs". Most wheelchair dealers also sell patient handling equipment. Wheelchair and medical supply companies which sell these products are supplied with suggested retail pricing by the manufacturers but are not required to use this pricing. Dealers are free to sell these products for any price they like, so it's always advisable to shop around a bit to find the best prices. Also bear in mind that the lowest price is not always the best deal. If you save a few dollars by using a dealer with a bad after sale service, you may have wished you'd paid the extra money to a more reputable company.